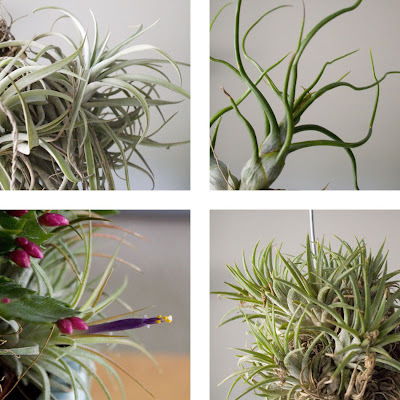 We all know about the spectacular "Christmas cactus" and its impressive winter show of flowers, but here's another versatile epiphyte that you can use in your holiday decor: Tillandsia! Also known as 'air plants', tillandsias obtain their water and nutrients from nothing more than rain, dust, and the humidity in the air. The Christmas cactus is stealing the show right now, but when those blooms are spent, the tillandsias will keep the container interesting. All I did for this container was sink a small zygocactus, pot and all into the container, then placing tillandsias along the rim. One of the tillies to the left is blooming right now, and when grown in sun the foliage will turn bright red at flowering time. Tilandsia's adaptability and silvery foliage make them ideal candidates for interior design. You've probably seen them fizzle out as one of those tacky refrigerator magnets, but a little extra light and a weekly sprits of water can go a long way to keeping your tillies healthy and spectacular. I hang them in clumps, mount them on trees, and simply set them on my metal rack where they get lots of airflow and extra water whenever I water the other plants. 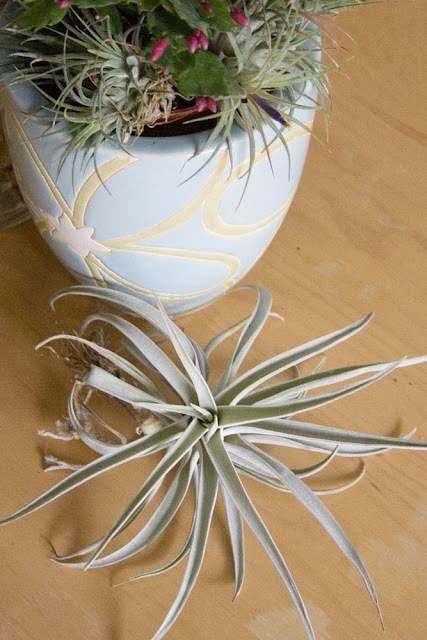 I know many of you grow tillandsia anyways, so why not group them with some silvery ornaments in a centerpiece? Better yet, consider using them to decorate the Christmas tree! The dramatic contrast that the white leaved varieties like t. harrisii would have against the dark green needles would make a really powerful visual statement. The best part about using tillandsias in your holiday decor is that they're very easy to move around and place wherever your imagination takes you. When the Christmas cactus in this display has finished blooming, those 'air plants' will have a second life in a festive wreath! 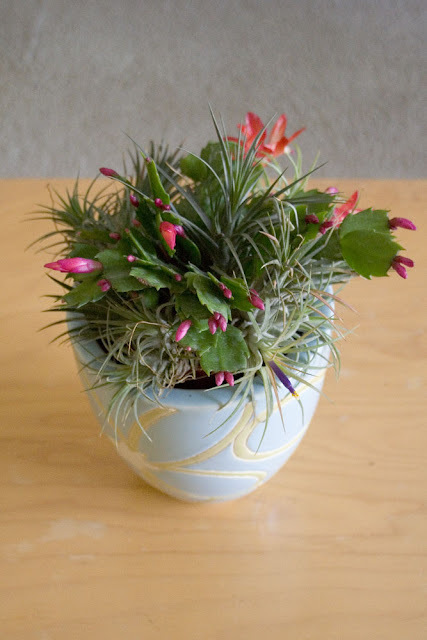 ive never thought of combining christmas cactus with anything! tillandsias are perfect for that. beautiful. A lovely tribute to the Tillandsia! Any bromeliad is a great plant, I say. Your post has reminded me that I forgot to cover or even check on the tillandsias I had stuck on the tall date palm trunk earlier in the year. Oh, I hope they are cold-hardy. They made it through two winters past, but they were under the tree fern, which was warmed nicely by lights. Great ideas, I brought mine into the house and hung them in the window. I like the idea of combining them with the Christmas cactus. I'll have to get some more :) and do that. Tillandsia are so exotic and pretty! They look so pretty with the Christmas cactus. Hmmm....hanging tilly on a christmas tree seems fun!! 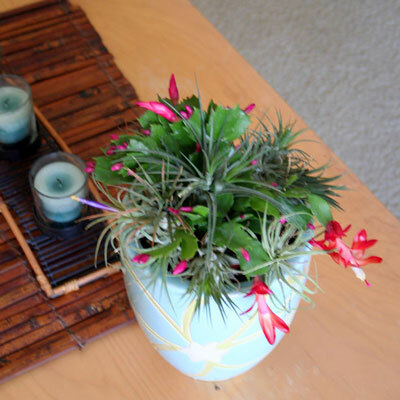 Great use of tillandsias mixed in with the Christmas cactus. I love tillandsias. Mine are indoors right now, and I'm enjoying seeing them up close everyday. Fantastic idea, Steve! I love the look of your arrangement!! You're so creative! Thanks for all the kind comments everyone! Oh, and Floridagirl, be sure to tell me how the tillies fared!